Democrat Mike McGuire currently represents Senate District 2 and will not be termed out until 2026. McGuire will not be up for re-election until 2018. Senator Mike McGuire is a third generation Northern Californian, whose family farmed prunes and grapes in the Alexander Valley for nearly a half century. Raised by his mom and grandma, Mike worked his way through high school and college and enjoyed a career in the radio and television industries. Mike was first elected to the Healdsburg School Board when he was 19. As one of Northern California’s youngest school board presidents, he led successful efforts to rebuild local decaying schools. In 2004, Mike was elected to the Healdsburg City Council where he was the city’s youngest mayor and was instrumental in creating one of the most successful local economies and stable municipal budgets in the region. 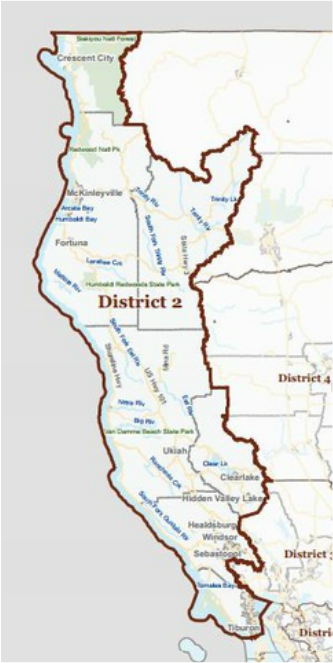 In 2010 – during the depth of the recession – Mike was elected to the Sonoma County Board of Supervisors. He helped lead efforts that turned years of deficits into a multi-million dollar surplus and brought forward the county's economic recovery and jobs plan that made Sonoma County one of top counties in job growth in California. Mike has led efforts that are investing historic levels – $160 million – in local roads, bridges and highways. He has been a champion for strong public schools, including co-founding the Career Technology Education Foundation that has invested over $1 million in career training classes in local high schools. Mike has always been a tireless advocate for our environment. He has helped protect and preserve tens of tens of thousands of acres of open space, watersheds and coast and he successfully fought to keep our regional and state parks open to the public. Mike attended Santa Rosa Junior College and graduated from Sonoma State University. He is married to local high school teacher and middle school assistant-principal, Erika McGuire. Erika and Mike live in Healdsburg.